Several months ago I read an entry on Stephenie Meyer’s official site by the webmaster, controversially stating that his favourite of her novels was The Host, the stand alone adult fiction novel which has no connection to the famous Twilight Saga. I thought he was talking nonsense, but it was enough to cause me to buy The Host. Now, around four months after buying it, I’ve just read it – I was scared to in case it let me down after how much I loved Twilight. 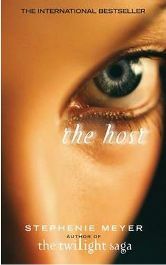 The Host tells the story of Melanie, a human, and Wanderer, a soul – a species of alien who live in host bodies. They have colonised Earth, and have taken over the population’s bodies. Wanderer is inserted into Melanie, a member of the small human resistance, but soon realises that instead of only having access to Melanie’s memories, Melanie is alive and kicking in her mind. Soon they go off in search of Melanie’s younger brother Jamie, and the love of her life, Jared. The first thing I realised about The Host is that it has a completely different feel to it than I expected. I read the blurb on the back – aliens taking over human bodies and running Earth, that sounded pretty dark and futuristic to me. But it’s not. Aside from a few small additions by the souls, such as shuttles and medicine to fix everything, Earth is completely recognisable as it is today. Except for the lack of war and violence – souls are a peaceful, trusting species. I thought that Earth would be in tatters, all broken and burning like in the movies, but it was in fact a very light and happy place. I didn’t expect The Host to captivate me like Twilight had – I read that in one sitting the first time, I loved it so much. This didn’t happen with The Host, possibly because it is quite a hefty book, but also because it took me longer to get drawn into the story, but once it had me, I struggled to put the book down. I found a few times that I had been reading for an hour and a half instead of half an hour like I intended. I missed most of Strictly Come Dancing last weekend because I couldn’t tear my eyes away from the pages of The Host. The story of The Host really is excellent, and, I think, very original. I may be wrong, but I’ve never come across what the blurb describes as “a love triangle involving only two bodies” before. Once more characters were introduced, I really found myself torn as to what outcome I wanted for Melanie and Wanderer, and I think that is a sign of a good book. If I had decided early on what I wanted, I could have been disappointed. As it was I was changing allegiances with almost every chapter, and right up until the end, I had no idea what the final outcome would be. In fact, there are a few shocks on the last few pages which came as a complete surprise to me. One thing that I’ve always said about Twilight and Stephenie Meyer is that while she tells her stories and sells her characters beautifully, she’s no master of the English language, and that the likes of J.K. Rowling are better writers than her. Now for some reason I can’t quite put my finger on, I think that The Host better demonstrates her writing ability than the Twilight Saga does. It is a beautifully crafted story, and it is excellently written. I’m not sure it’s prize winning standards, but it is an excellent piece of writing, and I’ve come away from it with an elevated opinion of Meyer and her skills. As you can probably tell, I adored The Host. I’m not quite ready to agree that it’s her best novel (despite the writing skills in this, I love the Twilight stories too much), but it had me wavering for a while. I stated at the start of this review that The Host is a stand alone novel, and for the moment it is, but Meyer does actually have plans to continue it into a trilogy, and it is to be made into a movie (www.stepheniemeyer.com), which is a rather exciting prospect. The Host is excellent. Even if you’re an ardent Twilight hater, don’t hold it against Meyer completely, because The Host is far removed from the teenage world of Twilight, and you’ll be missing out if you don’t give it a go. No Comments on "The Host"